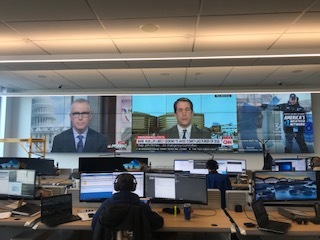 Wildfire Technology Integration out of Middlesex, New Jersey, installed a massive 8 x 3 video wall measuring 27 feet 6.75 inches wide by 11 feet 1.5 inches high at American Water’s new headquarters in Camden, New Jersey, using twenty four Christie Digital FHD553 55-inch LCD panels. The video wall is located in a vast bright room surrounded by glass overlooking the Delaware River. LCD display technology, both backlit CCFL and LED backlit LCD, suffers from serious white and black field uniformity issues, which usually makes color matching quite difficult, especially with so many panels. The process was however fairly straight forward in the case of the Christie Digital panels I color matched and calibrated at American Water. The first reason, which I attribute to Christie’s excellent design, is that the panels behaved very similarly. The second reason is that the process is less complex when color matching and calibrating the same panels as opposed to different makes and models, an issue that I usually encounter when calibrating and color matching LCD and OLED monitors at Post Production facilities, for example. At the factory presets, the grayscale on all the panels was extremely blue. The difference in luminance and black level between the panels was producing significant black and white uniformity issues. Suffice it to say, overall color fidelity was pretty poor at the factory presets on these panels. Christie Digital’s Video Wall toolbox software made the color matching a great deal easier than it was some years ago when I calibrated American Water’s 7 x 3 Video Wall with Christie’s FHD551 panels where I had to go into each panel individually with my signal generator to calibrate all of them. In the case of the 553s, Christie’s software gives you individual control over each panel when connected via RS232 into panel number one. It then enables you to generate the necessary test patterns for calibration from the panel you are adjusting. You simply move the meter to successive panels, generate the necessary patterns on the panel you are working on, and calibrate it. This makes the process more streamlined and saves time. The Command Center room where the video wall is located is a very high ambient light environment. Therefore, high light output is required in order to deliver a compelling image. I first matched white level at about 100 fTLs or roughly 350 Nits. This is very near the maximum light output capability of the panels. The Christie Digital’s FHD553 55-inch LCD panels provide only basic calibration tools like 2 point grayscale adjustments, and only two choices of gamma Off and 2.2. However, these basic calibration features work very well, and the results were therefore impressive. Of course, I chose the 2.2 gamma setting as it produced a smooth curve as opposed to the Off setting which resulted in a choppy gamma curve. Matching the luminance, setting black level correctly, and calibrating the grayscale to the reference standard of D6500 produced mostly excellent results with only a few panels exhibiting slightly different luminance characteristics. I then made adjustments to those three panels by eye achieving a perceptual match with the rest of the panels in the wall. After calibration, the picture was rich, saturated, and delivered exceptional color fidelity. Color space nearly perfectly matched the Rec 709 specifications for the primary and secondary colors. The photo of the video wall with the all blue background clearly shows that the uniformity of color post calibration is quite good. The panels match nearly perfectly. The photo of the wall with the cable feeds in three different sections also shows solid uniformity and natural color reproduction.